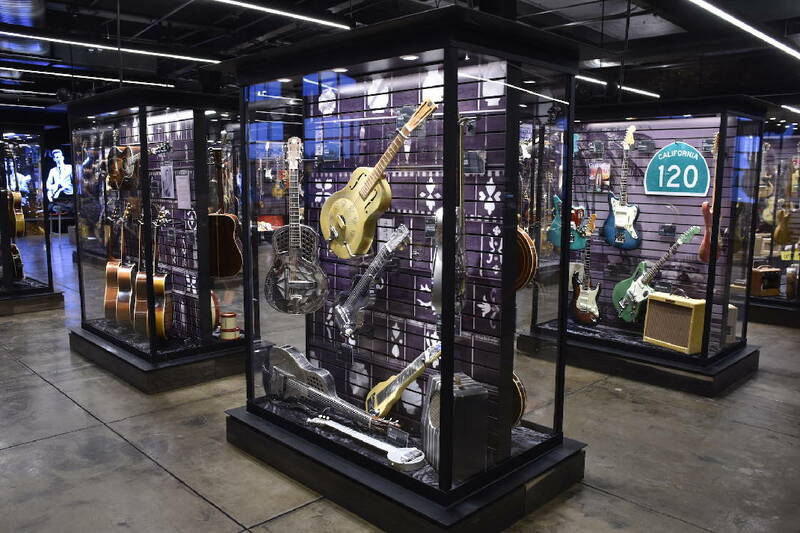 More than 1,700 guitars are in the Songbirds Guitar Museum collection. Some 500 will be on display at any one time. Tour times for Songbirds Museum are 11 a.m., 1 p.m. and 3 p.m. daily along with 5 p.m. on most Thursdays, Fridays and Saturdays. Visit www.songbirdsguitars.com for upcoming events and information. The story of the solid-body electric guitar parallels post-World War II America and the pride, craftsmanship and eye for design of its young men and women. The Songbirds Guitar Museum, located in the Chattanooga Choo-Choo complex, reflects American cultural changes from the black-and-white 1950s through the brilliant color of the '70s. Follow the museum's timeline, and you can track the transformation of earth-tone guitars in the early years to the more daring designs and living color of the 1960s. You also can see a dramatic decline in quality moving toward the 1970s when the "vintage" guitar market was born. The story begins with Leo Fender, the first person to mass produce a solid-body guitar. His initial designs of the Esquire and Broadcaster models came in a blonde/butterscotch finish. In 1952, Ted McCarty, president of Gibson Guitars, became concerned that Fender had a jump on him with a solid-body guitar. McCarty created and introduced Gibson's first solid-body guitar, the Gibson Les Paul, which came in a gold finish and featured an arched top more like a traditional jazz guitar. The Les Paul Jr. model and the LP Custom followed a year later and came in a black finish. Guitar finishes in reds, blues and greens, only arrived in the 1960s along with color television. McCarty, an engineer, was a hands-on designer at Gibson from 1948 until 1965 when he resigned. He and his team were responsible for the design of the Les Paul model as well as the ES-335 Semi hollow-body series and many others, including the ill-fated but highly collectible modern series, which featured the Flying V and the Explorer. The turning point in history for guitar instrument quality was around 1965. The Beatles hit our shores in February 1964 and became a major American music sensation. The group's two guitars, bass and drums reflected a change in popular instrumentation, as the saxophone began to be replaced by another guitar player. Thus began the British invasion in pop music. Suddenly every kid wanted to play the guitar. Together, Fender, Gibson and other industry majors shipped around 750 of their popular models each year. In a short period of time, the industry began to produce thousands of guitars but lost its attention to detail. New machines sped up the building process for instruments that were once hand cut and sanded with care. Building and distributing guitars at such a fast pace led to a drop in quality. In December 1964, Fender sold his company to CBS. Officials knew little about building guitars and had to maintain profit margins and answer to shareholders. The same scenario played out at Gibson's facility, where the quality of its instruments deteriorated. The story for those major guitar companies can be compared to that of the American automotive industry. The good news? Both companies were bought out in the 1980s by investors, who wanted to restore the quality and the reputations of these iconic musical instrument manufacturers. Visitors to Songbirds Guitar Museum can see the evolution of the instruments from 1950 to 1979 and how changes in guitars influenced the music of the times. From the "Ozzie and Harriet" '50s to London's "Swinging '60s," the display of 550 guitars vividly shows how America moved from a black-and-white world to living color. Irv Berner began his music career after seeing the Beatles on the Ed Sullivan Show in 1964. He is general manager of the Songbirds Guitar Museum. For more visit chattahistoricalassoc.org.